Can you tell me something about the relationship between humans and the dinosaurs… Ahem, the machines… I call them Dinosaurs because it’s cooler. Aloy almost seems not to treat them as enemies. Mark Norris: I think the line you’re specifically referring to is the one in the E3 demo in which she says “Sorry little one, I couldn’t let you call for help,” and that’s actually an incredibly important point about what’s happening inside Horizon: Zero Dawn. G: Simple fanboy question: how big is the biggest machine in the game? MN: Really, really big actually. The Thunderjaw that you saw is 24 meters long by 10 meters high. That’s not the biggest. There are two or threee machines that are even larger than the Thunderjaw. I can’t give you the exact specifications of what those are yet. One thing that we saw in the E3 video is the machine that we call the Stormbringer, if you take a look at the wingspan on that guy… It’s always hard to say what’s big, because his wingspan is enormous, but there are also other machines that are bigger in terms of their central body. G: Yet, there’s something I’m curious about, and that is if there’s going to be any kind of vehicles, mounts, maybe flying? MN: Smart journalist asks smart question to try to get me to answer a question that really says how big the world is, right? (Laughs) The reality is, a certain size of the world I think demands a mount, right? We take a look at a world like The Witcher, which is an enormous world, we take a look at a world like Skyrim, which is 41 square kilometers, and they’ve added mounts. We’re not ready to talk about the different ways that Aloy moves around the world, but what I can guarantee is, it’s not just walking and running. Certainly, she gets around the world in a couple of different ways. This game looks like it will be a lot of fun. Loving the world they are creating. Pushed back to February 28, 2017. Damn, nearly another year? That's a big bump. As far as I know, we never got a release date beyond "2016" before this, so it could be a big bump or could be a small bump. Not surprised, since it feels like we haven't seen anything about the game since the announce. Yeah. Still, I'm very excited for this one! I have this on preorder for $72 + tax from Best Buy thanks to that Visa Checkout promotion. It looks like a nice CE. Hope that the game is good and this doesn't turn into another The Order 1886. So far, it looks good. just a killer story trailer.....I get the feeling this is going to be a huge adventure; much like The Witcher or Skyrim, maybe not on that scale but close. I need to get back to Fallout and work on closing that one. Desker...is that visa Promo still up? Nope, it was a one day deal thing (more like a couple hours thing). I posed it in the deals forum that day when I also ordered the CE. Yup, I think I ordered it thanks to you matty. Last edited by K&AJones; 01-13-17 at 12:28 PM. Previews are out today for the game. 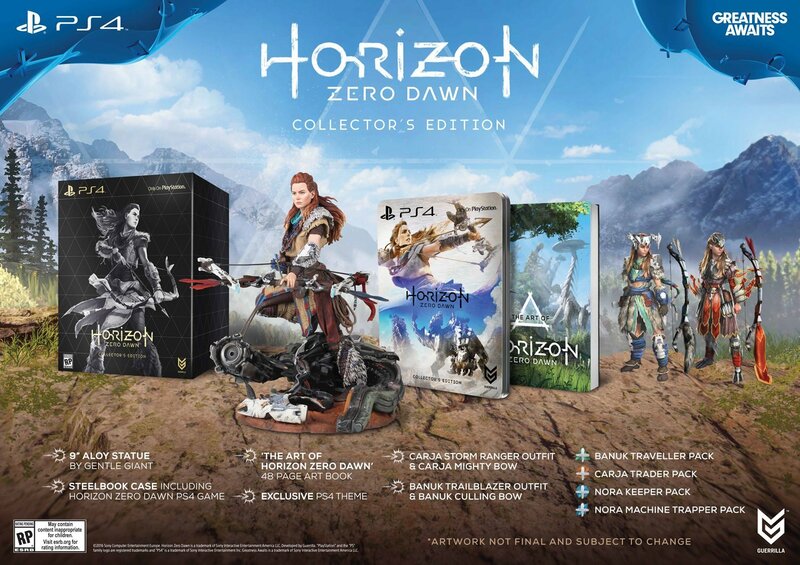 Horizon Zero Dawn, which comes to PlayStation 4 on Feb. 28, looks to be a game where players will be able to lose themselves for dozens of hours: foraging for scrap and upgrading their gear, hunting down dozens of types of machines, and embarking on no shortage of quests and errands. While much of Horizon will appear familiar, if not downright rote, from a gameplay perspective, its beauty and its mysteries will help it stand out among its open-world ancestors. The result is a game that, for now, feels more Far Cry than The Witcher; more exciting for the experiences you create yourself or that drift along your path, than a world full of set stories to discover and affect. In the hours I played, building up Aloy’s hunting tools alongside her innate skills filled the time very nicely, leaving me more than happy to leave scripted missions more or less alone. The lure of that next kill, an untested weapon, or terra incognita remained strong enough to keep me longing for more when I was pulled away from the controller – I’d barely scratched the surface of the game’s techno-zoology (there are seemingly 26 robot types to discover), and only just begun Aloy’s journey west across the map. The question is how much more there is over Horizon’s horizon – if it can keep up that E3 demo pace, constantly offering the promise of new ideas in the player’s eyeline, its neo-neolithic world should more than make up for any story shortcomings. I’ve been excited about Horizon for a while, and I’m glad that excitement wasn’t wasted. I can’t wait to learn more about Aloy and her world, and I’m most excited to keep refining my combat style when the final game is out. Based on what I saw at the preview, I’m committing to more time with Aloy and her world. Horizon paints its concepts in broad strokes, but I think the end result is still an image that’s striking to behold. Sounds good to me. I love open world action games like Far Cry. Ditto! Hearing that comparison makes me even more excited than I already was. The only annoying thing for me has nothing to do with the game itself...just the fact that this comes out a few days before the new Zelda. ...and in case anyone didn't know or cares for that matter; game will have Photo Mode....I had a blast with it in Infamous: Second Son.